This is the part of your braces which actually moves the teeth. The arch wire is attached to the brackets by small elastic ligatures or wires. Arch wires are changed throughout the treatment. Each change brings you closer to the ideal tooth position. Occasionally, a bracket may come loose and become an irritation to your mouth. You can remove the loose bracket and save it in an envelope to bring to the office. Please call the office if a loose bracket is irritating you or if you are in discomfort. At some time during treatment, it may be necessary to wear elastics to coordinate the upper and lower teeth and perfect the bite. Once teeth begin to move in response to elastics, they move rapidly and comfortably. If elastics (rubber bands) are worn intermittently, they will continually “shock” the teeth and cause more soreness. When elastics are worn one day and left off the next, treatment slows to a standstill or stops. Sore teeth between appointments usually indicate improper wear of headgear or elastics or inadequate hygiene. Wear your elastics correctly, attaching them as you were told. Wear elastics all the time, unless otherwise directed. Take your elastics off while brushing. Change elastics as directed, usually once or twice a day. Often called a “night brace”. The headgear is used to correct a protrusion of the upper or lower jaw. It works by inhibiting the upper jaw from growing forward, or downward growth of the upper jaw or even by encouraging teeth to move forward, if that is the case. Ligatures, also called O rings, are little rings used to attach the arch wire to the brackets. These rings come in standard gray or clear, but also come in a wide variety of colors to make braces more fun. Ligatures are changed at every appointment to maintain good attachment of the arch wire to the bracket, enabling our patients to enjoy many different color schemes throughout treatment. A plastic or rubber donut piece which the orthodontist uses to create space between your teeth for bands used in preparation for the placement of braces. 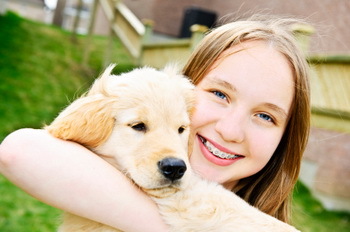 You will be shown the proper care of your braces when your orthodontic treatment begins. Proper cleansing of your mouth is necessary every time you eat. Teeth with braces are harder to clean, and trap food very easily. If food is left lodged on the brackets and wires, it can cause unsightly etching and permanent white marks on the enamel on your teeth. Your most important job is to keep your mouth clean. If food is allowed to collect, the symptoms of gum disease will show in your mouth. The gums will swell and bleed and the pressure from the disease will slow down tooth movement. FLUORIDE RINSE OR GEL: Are recommended for preventive measures. Fluoride rinses or gels are very helpful in protecting enamel by hardening the surface. Clean the retainer by brushing with toothpaste. If you are wearing a lower fixed retainer be extra careful to brush the wire and the inside of the lower teeth. Always bring your retainer to each appointment. Avoid flipping the retainer with your tongue, this can cause damage to your teeth as well as the retainer. Place the retainer in the plastic case when it is removed from your mouth. Never wrap the retainer in a paper napkin or tissue, someone may throw it away. Don’t put it in your pocket or you may break or lose it. Excessive heat will warp and ruin the retainer. If elastics (rubber bands) are worn intermittently, they will continually “shock” the teeth and cause more soreness. Sore teeth between appointments usually indicate improper wear of headgear or elastics or inadequate hygiene. Wear your elastics correctly, attaching them as instructed. Wear elastics all the time, unless otherwise directed. Take your elastics off while brushing. Change elastics as directed, usually once or twice a day. Occasionally, a bonded bracket may come loose. You can remove the loose bracket and save it in an envelope to bring to the office or leave it where it is, if it is not causing any irritation. If a loose bracket is irritating you, please call the office. If a wire is poking your gums or cheek, there are several things you can try until you can get to the office for an appointment. First try a ball of wax on the wire that is causing the irritation. You may also try using a nail clipper or cuticle cutter to cut the extra piece of wire that is sticking out. Sometimes, a poking wire can be safely turned down so that it no longer causes discomfort. To do this you may use a pencil eraser, or some other smooth object, and tuck the offending wire back out of the way. Rinse with warm water, eat a soft diet, acetaminophen (Tylenol) or ibuprofen (Advil) can be taken as directed on the bottle. Specialists in Orthodontics serving Adults and Children in Marblehead, Everett and Quincy Market in Boston, MA.